And some may poo-poo the fact that I make it with all frozen veggies. In fact, I poo-poo frozen veggies usually and don’t use them much myself, but make ONE REALLY BIG exception here. I should really listen to my younger sister Kathy, who swears by and serves her family frozen veggies more regularly, but honestly, it’s just not a habit I’ve developed yet. I should consider them though because I have the “guilts” about rotting fresh vegetables when I’m overzealous while produce shopping. Why are frozen veggies such an alluring option? Here are some of the advantages: most frozen vegetables are processed at their peak ripeness containing lots of nutrients and the frozen bags are affordable! You cannot deny how extremely CONVENIENT they are, ready in your freezer when you are ready to cook. If you haven’t shopped lately, you won’t believe the selection of mixed vegetables. These processors have gone way beyond the “veggies for stew”. 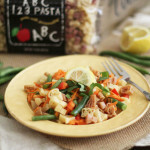 There is a California mix, and Italian blend, a blend for stir fry veggies, and more. Just looking at the freezer display inspires me think of other ways to use these frozen friends! Chunky Vegetable Soup with Pasta is also very forgiving. It’s a recipe that doesn’t have to be measured out exactly. Taste and adjust and don’t be afraid! If I don’t have 2 cans of tomatoes, I just add one can and make up the difference with water and additional bouillon seasoning. For some other cold weather favorites, try our Cheesy Beef and Noodle Casserole (Lightened Up!) or Butternut Squash and Kale Cannelloni. 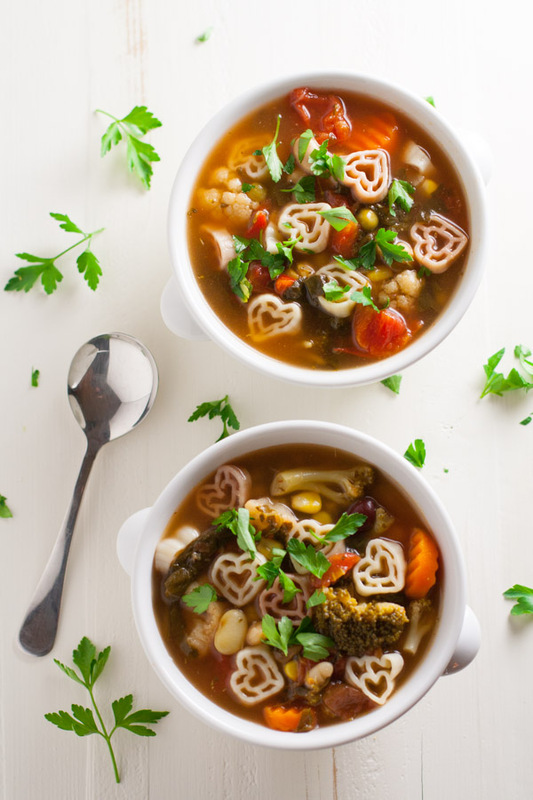 The mix of veggies in this soup can vary too. Add what you like or what catches your eye when you open that freezer door! Add or substitute frozen okra, lima beans, pearl onions, brussel sprouts, or whatever blend your family desires. 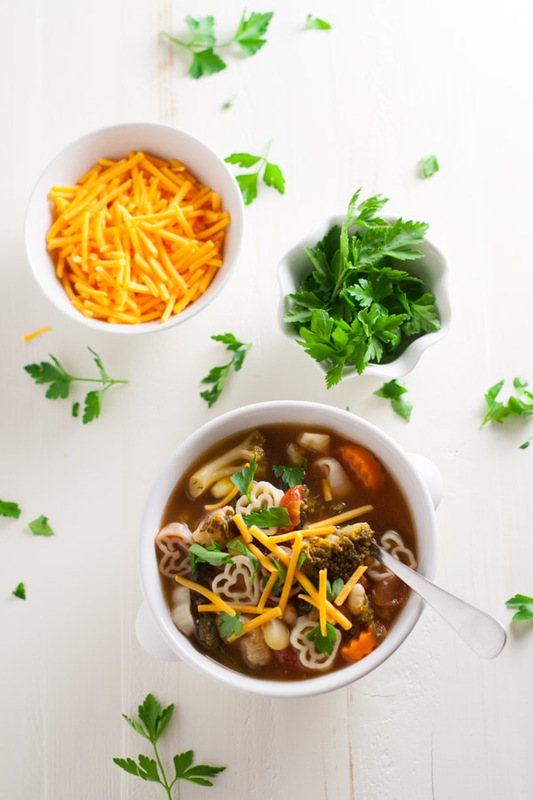 I always end up with a slightly different version of this soup – and that makes it fun! Especially when you make it as often as I do! Here is my routine (which I highly recommend :)) I make this recipe on Sunday afternoon/night, using my favorite 8 quart stock pot. I simmer for about 30 minutes. I stick the pot, covered, in my garage to cool off for an hour or two. I then transfer the soup into multiple sized plastic tubs for the freezer and fridge…some for lunch portions, one for dinner the next night, one for after school snacking, and one for a future dinner. (PS: I’m nibbling the entire time during this process.) This weekly ritual is a short investment of time that pays huge dividends. I cook my pasta separately and add the desired amount to each bowl. 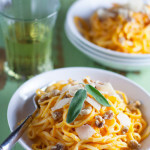 This month I had to feature our Heart Pasta – but any short shape will do! 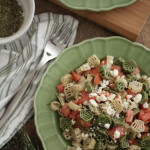 If you’d like to browse our pasta selection to jazz up your soup, check out The Pasta Shoppe. And if you have any fundraising needs, Fun Pasta Fundraising is a simple way to raise money for your group! Enjoy my friends! Easy and delish! Makes approx 24 cups! Eat tonight and freeze for later! Cook pasta as directed on package, drain, and toss with olive oil. 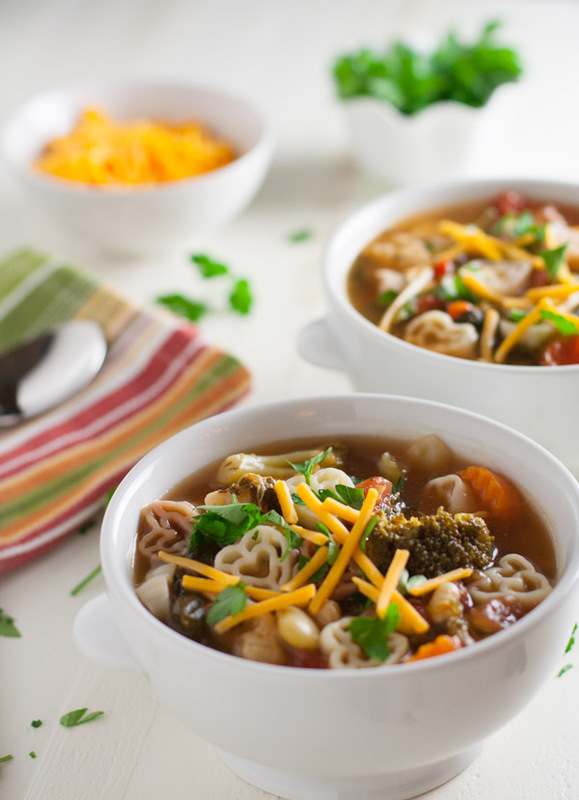 You'll use the quantity of pasta you desire for each bowl of soup. Use the leftover pasta with your favorite sauce for another meal! Combine all frozen vegetables in 8 quart stock pot. Add canned beans and Rotel tomatoes if desired. Dice and add entire 2 cans of tomatoes with juice. Fill pot with water, to just above vegetable line. Over medium-high heat, bring soup to a boil. Add bouillon paste and seasonings. 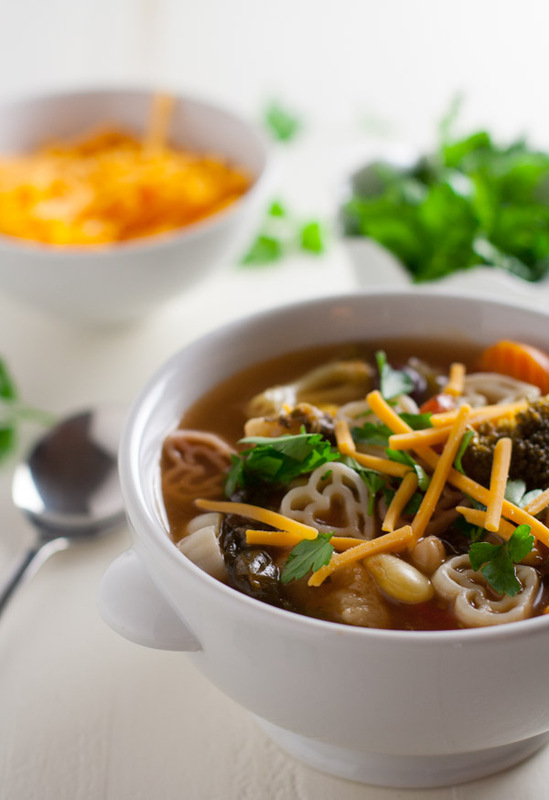 Serve soup in bowls with desired amount of pasta! Top with shredded cheddar, fresh parsley, sour cream, chopped green onions, Tabasco, or whatever else sounds good! This recipe has lots of flexibility built in! Be creative and have fun! *"Better than Bouillon" paste was purchased at Costco. Substitute any kind of beef base bouillon cube or paste. Water can also be substituted with a beef stock! **Aleppo pepper is similar to red pepper flakes and/or paprika. It has a moderate heat level and some describe the taste similar to ancho chilies. It is a Middle Eastern/Mediterranean spice that is now used widely in the US. Yum! This sounds like the perfect lunch for this cold, blustery weekend. When is Spring coming??!!! I’ve already made this again!! I love to use frozen veggies, too. This is really yummy. Delicious soup and so easy to make. Perfect for the colder weather.